ALTOPREV lovastatin extended-release tablets contain a cholesterol-lowering agent isolated from a strain of Aspergillus terreus. After oral ingestion, lovastatin, which is an inactive lactone, is hydrolyzed to the corresponding (beta)-hydroxyacid form. This is a principal metabolite and inhibitor of 3-hydroxy-3-methylglutaryl-coenzyme A (HMG-CoA) reductase. This enzyme catalyzes the conversion of HMG-CoA to mevalonate, which is an early and rate limiting step in the biosynthesis of cholesterol. Lovastatin is a white, nonhygroscopic crystalline powder that is insoluble in water and sparingly soluble in ethanol, methanol, and acetonitrile. ALTOPREV extended-release tablets are designed for once-a-day oral administration and deliver 10 mg, 20 mg, 40 mg, or 60 mg of lovastatin. In addition to the active ingredient lovastatin, each tablet contains the following inactive ingredients: acetyltributyl citrate; butylated hydroxy-anisole; candellila wax; cellulose acetate; confectioner's sugar (contains corn starch); F D & C yellow # 6; glyceryl monostearate; hypromellose; hypromellose phthalate; lactose; methacrylic acid copolymer, type B; polyethylene glycols (PEG 400, PEG 8000); polyethylene oxides; polysorbate 80; propylene glycol; silicon dioxide; sodium chloride; sodium lauryl sulfate; synthetic black iron oxide; red iron oxide; talc; titanium dioxide and triacetin. The involvement of low-density lipoprotein cholesterol (LDL-C) in atherogenesis has been well documented in clinical and pathological studies, as well as in many animal experiments. Epidemiological and clinical studies have established that high LDL-C and low high-density lipoprotein cholesterol (HDL-C) levels are both associated with coronary heart disease. However, the risk of developing coronary heart disease is continuous and graded over the range of cholesterol levels and many coronary events do occur in patients with total cholesterol (Total-C) and LDL-C levels in the lower end of this range. ALTOPREV has been shown to reduce LDL-C, and Total-C. Across all doses studied, treatment with ALTOPREV has been shown to result in variable reductions in triglycerides (TG), and variable increases in HDL-C (see Table III under Clinical Studies ). Lovastatin immediate-release tablets have been shown to reduce both normal and elevated LDL-C concentrations. LDL is formed from very low-density lipoprotein (VLDL) and is catabolized predominantly by the high-affinity LDL receptor. The mechanism of the LDL-lowering effect of lovastatin immediate-release may involve both reduction of VLDL-C concentration, and induction of the LDL receptor, leading to reduced production and/or increased catabolism of LDL-C. Apolipoprotein B (Apo B) also falls substantially during treatment with lovastatin immediate-release. Since each LDL particle contains one molecule of Apo B, and since little Apo B is found in other lipoproteins, this strongly suggests that lovastatin immediate-release does not merely cause cholesterol to be lost from LDL, but also reduces the concentration of circulating LDL particles. In addition, lovastatin immediate-release can produce increases of variable magnitude in HDL-C, and modestly reduces VLDL-C and plasma TG (see Table IV under Clinical Studies ). The independent effect of raising HDL or lowering TG on the risk of coronary and cardiovascular morbidity and mortality has not been determined. The effects of lovastatin immediate-release on lipoprotein (a) [Lp(a)], fibrinogen, and certain other independent biochemical risk markers for coronary heart disease are unknown. Lovastatin, as well as some of its metabolites, are pharmacologically active in humans. The liver is the primary site of action and the principal site of cholesterol synthesis and LDL clearance (see DOSAGE AND ADMINISTRATION ). The appearance of lovastatin in plasma from an ALTOPREV extended-release tablet is slower and more prolonged compared to the lovastatin immediate-release formulation. A pharmacokinetic study carried out with ALTOPREV involved measurement of the systemic concentrations of lovastatin (pro-drug), lovastatin acid (active-drug) and total and active inhibitors of HMG-CoA reductase. The pharmacokinetic parameters in 12 hypercholesterolemic subjects at steady state, after 28 days of treatment, comparing ALTOPREV 40 mg to lovastatin immediate-release 40 mg, are summarized in Table I .
L=lovastatin, LA=lovastatin acid, TI=total inhibitors of HMG-CoA reductase, AI=active inhibitors of HMG-CoA reductase, C max =highest observed plasma concentration, C min =trough concentration at t=24 hours after dosing, T max =time at which the C max occurred, AUC 0-24hr =area under the plasma concentration-time curve from time 0 to 24 hr after dosing, calculated by the linear trapezoidal rule. ** Administered with the evening meal. 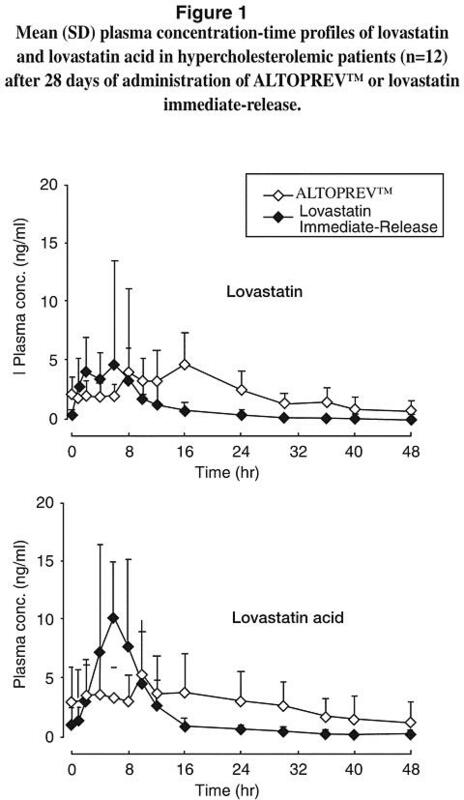 The mean plasma concentration-time profiles of lovastatin and lovastatin acid in patients after multiple doses of ALTOPREV or lovastatin immediate-release at day 28 are shown in Figure 1 . The extended-release properties of ALTOPREV are characterized by a prolonged absorptive phase, which results in a longer T max and lower C max for lovastatin (pro-drug) and its major metabolite, lovastatin acid, compared to lovastatin immediate-release. The bioavailability of lovastatin (pro-drug) as measured by the AUC 0-24hr was greater for ALTOPREV compared to lovastatin immediate-release (as measured by a chemical assay), while the bioavailability of total and active inhibitors of HMG-CoA reductase were equivalent to lovastatin immediate-release (as measured by an enzymatic assay). With once-a-day dosing, mean values of AUCs of active and total inhibitors at steady state were about 1.8-1.9 times those following a single dose. Accumulation ratio of lovastatin exposure was 1.5 after multiple daily doses of ALTOPREV compared to that of a single dose measured using a chemical assay. ALTOPREV appears to have dose linearity for doses from 10 mg up to 60 mg per day. When ALTOPREV was given after a meal, plasma concentrations of lovastatin and lovastatin acid were about 0.5-0.6 times those found when ALTOPREV was administered in the fasting state, indicating that food decreases the bioavailability of ALTOPREV. There was an association between the bioavailability of ALTOPREV and dosing after mealtimes. Bioavailability was lowered under the following conditions, (from higher bioavailability to lower bioavailability) in the following order: under overnight fasting conditions, before bedtime, with dinner, and with a high fat breakfast. In a multicenter, randomized, parallel group study, patients were administered 40 mg of ALTOPREV at three different times; before breakfast, after dinner and at bedtime. Although there was no statistical difference in the extent of lipid change between the three groups, there was a numerically greater reduction in LDL-C and TG and an increase in HDL-C when ALTOPREV was administered at bedtime. Results of this study are displayed in Table II . After Dinner group, and N=23 for the Before Bedtime group. * All changes from baseline are statistically significant. At steady state in humans, the bioavailability of lovastatin, following the administration of ALTOPREV, was 190% compared to lovastatin immediate-release. Absorption of lovastatin, estimated relative to an intravenous reference dose in each of four animal species tested, averaged about 30% of an oral dose. Following an oral dose of 14 C-labeled lovastatin in man, 10% of the dose was excreted in urine and 83% in feces. The latter represents absorbed drug equivalents excreted in bile, as well as any unabsorbed drug. In a single dose study in four hypercholesterolemic patients, it was estimated that less than 5% of an oral dose of lovastatin reaches the general circulation as active inhibitors. Both lovastatin and its (beta)-hydroxyacid metabolite are highly bound (>95%) to human plasma proteins. Animal studies demonstrated that lovastatin crosses the blood-brain and placental barriers. In animal studies, after oral dosing, lovastatin had high selectivity for the liver, where it achieved substantially higher concentrations than in non-target tissues. Lovastatin undergoes extensive first-pass extraction in the liver, its primary site of action, with subsequent excretion of drug equivalents in the bile. As a consequence of extensive hepatic extraction of lovastatin, the availability of drug to the general circulation is low and variable. Metabolism studies with ALTOPREV have not been conducted. Lovastatin is a lactone that is readily hydrolyzed in vivo to the corresponding (beta)-hydroxyacid, a potent inhibitor of HMG-CoA reductase. Inhibition of HMG-CoA reductase is the basis for an assay in pharmacokinetic studies of the (beta)-hydroxyacid metabolites (active inhibitors) and, following base hydrolysis, active plus latent inhibitors (total inhibitors) in plasma following administration of lovastatin. The major active metabolites present in human plasma are the (beta)-hydroxyacid of lovastatin, its 6'-hydroxy derivative, and two additional metabolites. The risk of myopathy is increased by high levels of HMG-CoA reductase inhibitory activity in plasma. Potent inhibitors of CYP3A4 can raise the plasma levels of HMG-CoA reductase inhibitory activity and increase the risk of myopathy (see WARNINGS , Myopathy/Rhabdomyolysis and PRECAUTIONS , Drug Interactions ). Lovastatin is a substrate for CYP3A4 (see PRECAUTIONS , Drug Interactions ). Grapefruit juice contains one or more components that inhibit CYP3A4 and can increase the plasma concentrations of drugs metabolized by CYP3A4. In one study, 1 10 subjects consumed 200 mL of double-strength grapefruit juice (one can of frozen concentrate diluted with one rather than 3 cans of water) three times daily for 2 days and an additional 200 mL double-strength grapefruit juice together with and 30 and 90 minutes following a single dose of 80 mg lovastatin on the third day. This regimen of grapefruit juice resulted in mean increases in the concentration of lovastatin and its beta-hydroxyacid metabolite (as measured by the area under the concentration-time curve) of 15-fold and 5-fold respectively (as measured using a chemical assay - liquid chromatography/tandem mass spectrometry). In a second study, 15 subjects consumed one 8 oz glass of single-strength grapefruit juice (one can of frozen concentrate diluted with 3 cans of water) with breakfast for 3 consecutive days and a single dose of 40 mg lovastatin in the evening of the third day. This regimen of grapefruit juice resulted in a mean increase in the plasma concentration (as measured by the area under the concentration-time curve) of active and total HMG-CoA reductase inhibitory activity [using a validated enzyme inhibition assay different from that used in the first study, both before (for active inhibitors) and after (for total inhibitors) base hydrolysis] of 1.34-fold and 1.36-fold, respectively, and of lovastatin and its (beta)-hydroxyacid metabolite (measured using a chemical assay - liquid chromatography/tandem mass spectrometry) of 1.94-fold and 1.57-fold, respectively. The effect of amounts of grapefruit juice between those used in these two studies on lovastatin pharmacokinetics has not been studied. In a single-dose study with ALTOPREV, the amounts of lovastatin and lovastatin acid excreted in the urine were below the lower limit of quantitation of the assay (1.0 ng/mL), indicating that negligible excretion of ALTOPREV occurs through the kidney. Lovastatin undergoes extensive first-pass extraction in the liver, its primary site of action, with subsequent excretion of drug equivalents in the bile. In a study with lovastatin immediate-release which included 16 elderly patients between 70-78 years of age who received lovastatin immediate-release 80 mg/day, the mean plasma level of HMG-CoA reductase inhibitory activity was increased approximately 45% compared with 18 patients between 18-30 years of age (see PRECAUTIONS , Geriatric Use ). In a single dose pharmacokinetic study with ALTOPREV, there were no statistically significant differences in pharmacokinetic parameters between men (n=12) and women (n=10), although exposure tended to be higher in men than women. In clinical studies with ALTOPREV, there was no clinically significant difference in LDL-C reduction between men and women. In a study of patients with severe renal insufficiency (creatinine clearance 10-30 mL/min), the plasma concentrations of total inhibitors after a single dose of lovastatin were approximately two-fold higher than those in healthy volunteers. The effect of hemodialysis on plasma levels of lovastatin and its metabolites have not been studied. No pharmacokinetic studies with ALTOPREV have been conducted in patients with hepatic insufficiency. ALTOPREV has been shown to reduce Total-C, LDL-C, and TG and increase HDL-C in patients with hypercholesterolemia. Near maximal response was observed after four weeks of treatment and the response was maintained with continuation of therapy for up to 6 months. In a 12-week, multicenter, placebo-controlled, double-blind, dose-response study in adult men and women 21 to 70 years of age with primary hypercholesterolemia, once daily administration of ALTOPREV 10 to 60 mg in the evening was compared to placebo. ALTOPREV produced dose related reductions in LDL-C and Total-C. ALTOPREV produced mean reductions in TG across all doses that varied from approximately 10% to 25%. ALTOPREV produced mean increases in HDL-C across all doses that varied from approximately 9% to 13%. 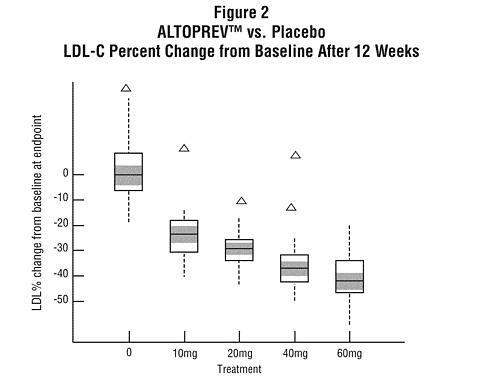 The lipid changes with ALTOPREV treatment in this study, from baseline to endpoint, are displayed in Table III . N=the number of patients with values at both baseline and endpoint. *Except for the HDL-C elevation with ALTOPREV 10 mg, all lipid changes with ALTOPREV were statistically significant compared to placebo. **For LDL-C, 33 patients had values at baseline and endpoint. The distribution of LDL-C responses is represented graphically by the boxplots in Figure 2 . The bottom line of the box represents the 25th percentile and the top line, the 75th percentile. The horizontal line in the box represents the median and the gray area is the 95% confidence interval for the median. The range of responses is depicted by the tails and outliers. A total of 365 patients were enrolled in an extension study in which all patients were administered ALTOPREV 40 mg or 60 mg once daily for up to 6 months of treatment. The lipid-altering effects of ALTOPREV were comparable to what was observed in the dose-response study, and were maintained for up to 6 months of treatment. In clinical studies with ALTOPREV, there were no statistically significant differences in LDL-C reduction in an older population (>/=65 years old), compared to a younger population (<65 years old). There were also no statistically significant differences in LDL-C reduction between male and female patients. Lovastatin immediate-release has been shown to be effective in reducing Total-C and LDL-C in heterozygous familial and non-familial forms of primary hypercholesterolemia and in mixed hyperlipidemia. A marked response was seen within 2 weeks, and the maximum therapeutic response occurred within 4-6 weeks. The response was maintained during continuation of therapy. Single daily doses given in the evening were more effective than the same dose given in the morning, perhaps because cholesterol is synthesized mainly at night. Lovastatin immediate-release was studied in controlled trials in hypercholesterolemic patients with well-controlled non-insulin dependent diabetes mellitus with normal renal function. The effect of lovastatin immediate-release on lipids and lipoproteins and the safety profile of lovastatin immediate-release were similar to that demonstrated in studies in nondiabetics. Lovastatin immediate-release had no clinically important effect on glycemic control or on the dose requirement of oral hypoglycemic agents. Lovastatin immediate-release was compared to placebo in 8,245 patients with hypercholesterolemia [Total-C 240-300 mg/dL (6.2 mmol/L-7.6 mmol/L), LDL-C >160 mg/dL (4.1 mmol/L)] in the randomized, double-blind, parallel, 48-week EXCEL study. All changes in the lipid measurements (see Table IV ) observed in lovastatin immediate-release-treated patients were dose-related and significantly different from placebo (p</=0.001). These results were sustained throughout the study. The Air Force/Texas Coronary Atherosclerosis Prevention Study (AFCAPS/TexCAPS), a double-blind, randomized, placebo-controlled, primary prevention study, demonstrated that treatment with lovastatin immediate-release decreased the rate of acute major coronary events (composite endpoint of myocardial infarction, unstable angina, and sudden cardiac death) compared with placebo during a median of 5.1 years of follow-up. Participants were middle-aged and elderly men (ages 45-73) and women (ages 55-73) without symptomatic cardiovascular disease with average to moderately elevated Total-C and LDL-C, below average HDL-C, and who were at high risk based on elevated Total-C/HDL-C. In addition to age, 63% of the participants had at least one other risk factor (baseline HDL-C <35 mg/dL, hypertension, family history, smoking and diabetes). AFCAPS/TexCAPS enrolled 6,605 participants (5,608 men, 997 women) based on the following lipid entry criteria: Total-C range of 180-264 mg/dL, LDL-C range of 130-190 mg/dL, HDL-C of </=45 mg/dL for men and </=47 mg/dL for women, and TG of </=400 mg/dL. Participants were treated with standard care, including diet, and either lovastatin immediate-release 20 mg - 40 mg daily (n= 3,304) or placebo (n=3,301). Approximately 50% of the participants treated with lovastatin immediate-release were titrated to 40 mg daily when their LDL-C remained >110 mg/dL at the 20-mg starting dose. Lovastatin immediate-release reduced the risk of a first acute major coronary event, the primary efficacy endpoint, by 37% (lovastatin immediate-release 3.5%, placebo 5.5%; p<0.001; Figure 3 ). A first acute major coronary event was defined as myocardial infarction (54 participants on lova-statin immediate-release, 94 on placebo) or unstable angina (54 vs. 80) or sudden cardiac death (8 vs. 9). Furthermore, among the secondary endpoints, lovastatin immediate-release reduced the risk of unstable angina by 32% (1.8% vs. 2.6%; p=0.023), of myocardial infarction by 40% (1.7% vs. 2.9%; p=0.002), and of undergoing coronary revascularization procedures (e.g., coronary artery bypass grafting or percutaneous transluminal coronary angioplasty) by 33% (3.2% vs. 4.8%; p=0.001). Trends in risk reduction associated with treatment with lovastatin immediate-release were consistent across men and women, smokers and non-smokers, hypertensives and non-hypertensives, and older and younger participants. Participants with >/=2 risk factors had risk reductions (RR) in both acute major coronary events (RR 43%) and coronary revascularization procedures (RR 37%). Because there were too few events among those participants with age as their only risk factor in this study, the effect of lovastatin immediate-release on outcomes could not be adequately assessed in this subgroup. In the Canadian Coronary Atherosclerosis Intervention Trial (CCAIT), the effect of therapy with lovastatin on coronary atherosclerosis was assessed by coronary angiography in hyperlipidemic patients. In this randomized, double-blind, controlled clinical trial, patients were treated with conventional measures (usually diet and 325 mg of aspirin every other day) and either lovastatin 20 mg-80 mg daily or placebo. Angiograms were evaluated at baseline and at two years by computerized quantitative coronary angiography (QCA). Lovastatin significantly slowed the progression of lesions as measured by the mean change per-patient in minimum lumen diameter (the primary endpoint) and percent diameter stenosis, and decreased the proportions of patients categorized with disease progression (33% vs. 50%) and with new lesions (16% vs. 32%). In a similarly designed trial, the Monitored Atherosclerosis Regression Study (MARS), patients were treated with diet and either lovastatin 80 mg daily or placebo. No statistically significant difference between lovastatin and placebo was seen for the primary endpoint (mean change per patient in percent diameter stenosis of all lesions), or for most secondary QCA endpoints. Visual assessment by angiographers who formed a consensus opinion of overall angiographic change (Global Change Score) was also a secondary endpoint. By this endpoint, significant slowing of disease was seen, with regression in 23% of patients treated with lovastatin compared to 11% of placebo patients. The effect of lovastatin on the progression of atherosclerosis in the coronary arteries has been corroborated by similar findings in another vasculature. In the Asymptomatic Carotid Artery Progression Study (ACAPS), the effect of therapy with lovastatin on carotid atherosclerosis was assessed by B-mode ultrasonography in hyperlipidemic patients with early carotid lesions and without known coronary heart disease at baseline. In this double-blind, controlled clinical trial, 919 patients were randomized in a 2 × 2 factorial design to placebo, lovastatin 10-40 mg daily and/or warfarin. Ultrasonograms of the carotid walls were used to determine the change per patient from baseline to three years in mean maximum intimal-medial thickness (IMT) of 12 measured segments. There was a significant regression of carotid lesions in patients receiving lovastatin alone compared to those receiving placebo alone (p=0.001). The predictive value of changes in IMT for stroke has not yet been established. In the lovastatin group there was a significant reduction in the number of patients with major cardiovascular events relative to the placebo group (5 vs. 14) and a significant reduction in all-cause mortality (1 vs. 8). There was a high prevalence of baseline lenticular opacities in the patient population included in the early clinical trials with lovastatin immediate-release. During these trials the appearance of new opacities was noted in both the lovastatin immediate-release and placebo groups. There was no clinically significant change in visual acuity in the patients who had new opacities reported nor was any patient, including those with opacities noted at baseline, discontinued from therapy because of a decrease in visual acuity. A three-year, double-blind, placebo-controlled study in hypercholesterolemic patients to assess the effect of lovastatin immediate-release on the human lens demonstrated that there were no clinically or statistically significant differences between the lovastatin immediate-release and placebo groups in the incidence, type or progression of lenticular opacities. There are no controlled clinical data assessing the lens available for treatment beyond three years. Therapy with ALTOPREV lovastatin extended-release tablets should be a component of multiple risk factor intervention in those individuals with dyslipidemia who are at risk for atherosclerotic vascular disease. ALTOPREV should be used in addition to a diet restricted in saturated fat and cholesterol as part of a treatment strategy to lower Total-C and LDL-C to target levels when the response to diet and other nonpharmacological measures alone has been inadequate to reduce risk. ALTOPREV is indicated to slow the progression of coronary atherosclerosis in patients with coronary heart disease as part of a treatment strategy to lower Total-C and LDL-C to target levels. ALTOPREV is indicated as an adjunct to diet for the reduction of elevated Total-C, LDL-C, Apo B, and TG, and to increase HDL-C in patients with primary hypercholesterolemia (heterozygous familial and non-familial) and mixed dyslipidemia (Fredrickson types IIa and IIb, see Table VI ) when the response to diet restricted in saturated fat and cholesterol and to other non-pharmacological measures alone has been inadequate. For TG levels >400 mg/dL (>4.5 mmol/L), this equation is less accurate and LDL-C concentrations should be determined by ultracentrifugation. In hypertriglyceridemic patients, LDL-C may be low or normal despite elevated Total-C. In such cases, ALTOPREV is not indicated. **/* **/* Some authorities recommend use of LDL-lowering drugs in this category if an LDL-C level of <100 mg/dL cannot be achieved by therapeutic lifestyle changes. Others prefer use of drugs that primarily modify triglycerides and HDL-C, e.g., nicotinic acid or fibrate. Clinical judgement also may call for deferring drug therapy in this subcategory. **/* **/* **/* Almost all people with 0-1 risk factor have 10-year risk <10%; thus, 10-year risk assessment in people with 0-1 risk factor is not necessary. After the LDL-C goal has been achieved, if the TG is still >/=200 mg/dL, non-HDL-C (Total-C minus HDL-C) becomes a secondary target of therapy. Non-HDL-C goals are set 30 mg/dL higher than LDL-C goals for each risk category. At the time of hospitalization for an acute coronary event, consideration can be given to initiating drug therapy at discharge if the LDL-C is >/=130 mg/dL (see NCEP Guidelines above). Hypersensitivity to any component of this medication. Active liver disease or unexplained persistent elevations of serum transaminases (see WARNINGS ). Atherosclerosis is a chronic process and the discontinuation of lipid-lowering drugs during pregnancy should have little impact on the outcome of long-term therapy of primary hypercholesterolemia. Moreover, cholesterol and other products of the cholesterol biosynthesis pathway are essential components for fetal development, including synthesis of steroids and cell membranes. Because of the ability of inhibitors of HMG-CoA reductase such as ALTOPREV to decrease the synthesis of cholesterol and possibly other products of the cholesterol biosynthesis pathway, ALTOPREV is contraindicated during pregnancy and in nursing mothers. ALTOPREV should be administered to women of childbearing age only when such patients are highly unlikely to conceive. If the patient becomes pregnant while taking this drug, ALTOPREV should be discontinued immediately and the patient should be apprised of the potential hazard to the fetus (see PRECAUTIONS , Pregnancy ). Lovastatin, like other inhibitors of HMG-CoA reductase, occasionally causes myopathy manifested as muscle pain, tenderness or weakness with creatine kinase (CK) above 10 × the upper limit of normal (ULN). Myopathy sometimes takes the form of rhabdomyolysis with or without acute renal failure secondary to myoglobinuria, and rare fatalities have occurred. The risk of myopathy is increased by high levels of HMG-CoA reductase inhibitory activity in plasma. Potent inhibitors of CYP3A4: Cyclosporine, itraconazole, ketoconazole, erythromycin, clarithromycin, HIV protease inhibitors, nefazodone, or large quantities of grapefruit juice (>1 quart daily), particularly with higher doses of lovastatin (see below; CLINICAL PHARMACOLOGY , Pharmacokinetics ; PRECAUTIONS , Drug Interactions , CYP3A4 Interactions ). Lipid-lowering drugs that can cause myopathy when given alone: Gemfibrozil, other fibrates, or lipid-lowering doses (>/=1 g/day) of niacin, particularly with higher doses of lovastatin (see below; CLINICAL PHARMACOLOGY , Pharmacokinetics ; PRECAUTIONS , Drug Interactions , Interactions With Lipid-Lowering Drugs That Can Cause Myopathy When Given Alone). Other drugs: The risk of myopathy/rhabdomyolysis is increased when either amiodarone or verapamil is used concomitantly with higher doses of a closely related member of the HMG-CoA reductase inhibitor class (see PRECAUTIONS , Drug Interactions , Other Drug Interactions ). The risk of myopathy/rhabdomyolysis is dose related. In a clinical study (EXCEL) in which patients were carefully monitored and some interacting drugs were excluded, there was one case of myopathy among 4933 patients randomized to lovastatin 20-40 mg daily for 48 weeks, and 4 among 1649 patients randomized to 80 mg daily. Use of lovastatin concomitantly with itraconazole, ketoconazole, erythromycin, clarithromycin, HIV protease inhibitors, nefazodone, or large quantities of grapefruit juice (>1 quart daily) should be avoided. If treatment with itraconazole, ketoconazole, erythromycin, or clarithromycin is unavoidable, therapy with lovastatin should be suspended during the course of treatment. Concomitant use with other medicines labeled as having a potent inhibitory effect on CYP3A4 at therapeutic doses should be avoided unless the benefits of combined therapy outweigh the increased risk. The dose of lovastatin should not exceed 20 mg daily in patients receiving concomitant medication with cyclosporine, gemfibrozil, other fibrates or lipid-lowering doses (>/=1 g/day) of niacin. The combined use of lovastatin with fibrates or niacin should be avoided unless the benefit of further alteration in lipid levels is likely to outweigh the increased risk of this drug combination. Addition of these drugs to lovastatin typically provides little additional reduction in LDL-C, but further reductions of TG and further increases in HDL-C may be obtained. The dose of Altoprev should not exceed 20 mg daily in patients receiving concomitant medication with amiodarone or verapamil. The combined use of Altoprev at doses higher than 20 mg daily with amiodarone or verap-amil should be avoided unless the clinical benefit is likely to outweigh the increased risk of myopathy. All patients starting therapy with lovastatin, or whose dose of lovastatin is being increased, should be advised of the risk of myopathy and told to report promptly any unexplained muscle pain, tenderness or weakness. Lovastatin therapy should be discontinued immediately if myopathy is diagnosed or suspected. The presence of these symptoms, and/or a CK level >10 times the ULN indicates myopathy. In most cases, when patients were promptly discontinued from treatment, muscle symptoms and CK increases resolved. Periodic CK determinations may be considered in patients starting therapy with lovastatin or whose dose is being increased, but there is no assurance that such monitoring will prevent myopathy. Many of the patients who have developed rhabdomyolysis on therapy with lovastatin have had complicated medical histories, including renal insufficiency usually as a consequence of long-standing diabetes mellitus. Such patients merit closer monitoring. Therapy with lovastatin should be temporarily stopped a few days prior to elective major surgery and when any major medical or surgical condition supervenes. From post-marketing reports with Altoprev, myopathy and rhabdomyolysis have been reported, especially in elderly patients initiating therapy with Altoprev at a dose of 60 mg per day. Thus, lower starting doses of Altoprev are recommended for elderly patients, particularly those with complicated medical conditions (see DOSAGE AND ADMINISTRATION, Elderly Patients ). Persistent increases (to more than 3 times the upper limit of normal) in serum transaminases occurred in 1.9% of adult patients who received lovastatin for at least one year in early clinical trials (see ADVERSE REACTIONS ). When the drug was interrupted or discontinued in these patients, the transaminase levels usually fell slowly to pretreatment levels. The increases usually appeared 3 to 12 months after the start of therapy with lovastatin, and were not associated with jaundice or other clinical signs or symptoms. There was no evidence of hypersensitivity. In controlled clinical trials (467 patients treated with ALTOPREV and 329 patients treated with lovastatin immediate-release) no meaningful differences in transaminase elevations between the two treatments were observed. In the EXCEL study (see CLINICAL PHARMACOLOGY , Clinical Studies ), the incidence of persistent increases in serum transaminases over 48 weeks was 0.1% for placebo, 0.1% at 20 mg/day, 0.9% at 40 mg/day, and 1.5% at 80 mg/day in patients on lovastatin. However, in post-marketing experience with lovastatin immediate-release, symptomatic liver disease has been reported rarely at all dosages (see ADVERSE REACTIONS ). In AFCAPS/TexCAPS, the number of participants with consecutive elevations of either alanine aminotransferase (ALT) or aspartate aminotransferase (AST) (>3 times the upper limit of normal), over a median of 5.1 years of follow-up, was not significantly different between the lovastatin immediate-release and placebo groups [18 (0.6%) vs. 11 (0.3%)]. The starting dose of lovastatin immediate-release was 20 mg/day; 50% of the lovastatin immediate-release treated participants were titrated to 40 mg/day at Week 18. Of the 18 participants on lovastatin immediate-release with consecutive elevations of either ALT or AST, 11 (0.7%) elevations occurred in participants taking 20 mg/day, while 7 (0.4%) elevations occurred in participants titrated to 40 mg/day. Elevated transaminases resulted in discontinuation of 6 (0.2%) participants from therapy in the lovastatin immediate-release group (n=3,304) and 4 (0.1%) in the placebo group (n=3,301). It is recommended that liver function tests be performed before the initiation of treatment, at 6 and 12 weeks after initiation of therapy or elevation of dose, and periodically thereafter (e.g., semiannually). Patients who develop increased transaminase levels should be monitored with a second liver function evaluation to confirm the finding and be followed thereafter with frequent liver function tests until the abnormality(ies) return to normal. Should an increase in AST or ALT of three times the upper limit of normal or greater persist, withdrawal of therapy with ALTOPREV is recommended. The drug should be used with caution in patients who consume substantial quantities of alcohol and/or have a past history of liver disease. Active liver disease or unexplained transaminase elevations are contraindications to the use of ALTOPREV. As with other lipid-lowering agents, moderate (less than three times the upper limit of normal) elevations of serum transaminases have been reported following therapy with lovastatin (see ADVERSE REACTIONS ). These changes appeared soon after initiation of therapy with lovastatin, were often transient, were not accompanied by any symptoms and interruption of treatment was not required. ALTOPREV may elevate creatine phosphokinase and transaminase levels (see WARNINGS and ADVERSE REACTIONS ). This should be considered in the differential diagnosis of chest pain in a patient on therapy with ALTOPREV. Lovastatin immediate-release was found to be less effective in patients with the rare homozygous familial hypercholesterolemia, possibly because these patients have no functional LDL receptors. Lovastatin immediate-release appears to be more likely to raise serum transaminases (see ADVERSE REACTIONS ) in these homozygous patients. The ALTOPREV extended-release tablets should be swallowed whole and not chewed, crushed or cut. Patients should be advised to report promptly unexplained muscle pain, tenderness or weakness (see WARNINGS , Myopathy/Rhabdomyolsis ). Drug interaction studies have not been performed with ALTOPREV. The types, frequencies and magnitude of drug interactions that may be encountered when ALTOPREV is administered with other drugs may differ from the drug interactions encountered with the lovastatin immediate-release formulation. In addition, as the drug exposure with ALTOPREV 60 mg is greater than that with lovastatin immediate-release 80 mg (maximum recommended dose), the severity and magnitude of drug interactions that may be encountered with ALTOPREV 60 mg are not known. It is therefore recommended that the following precautions and recommendations for the concomitant administration of lovastatin immediate-release with other drugs be interpreted with caution, and that the monitoring of the pharmacologic effects of ALTOPREV and/or other concomitantly administered drugs be undertaken where appropriate. Lovastatin is metabolized by CYP3A4 but has no CYP3A4 inhibitory activity; therefore it is not expected to affect the plasma concentrations of other drugs metabolized by CYP3A4. 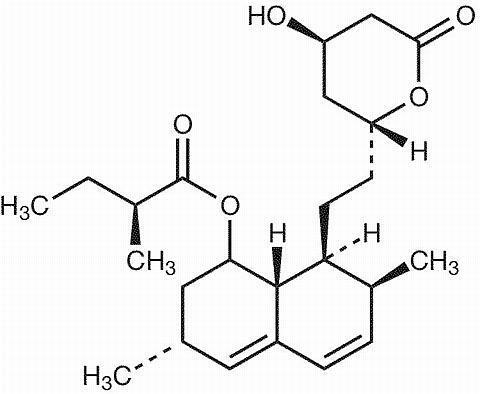 Potent inhibitors of CYP3A4 (below) increase the risk of myopathy by reducing the elimination of lovastatin. See WARNINGS , Myopathy/Rhabdomyolysis , and CLINICAL PHARMACOLOGY , Pharmacokinetics . The risk of myopathy is also increased by the following lipid-lowering drugs that are not potent CYP3A4 inhibitors, but which can cause myopathy when given alone. See WARNINGS , Myopathy/Rhabdomyolysis . Amiodarone or Verapamil: The risk of myopathy/rhabdomyolysis is increased when either amiodarone or verapamil is used concomitantly with a closely related member of the HMG-CoA reductase inhibitor class (see WARNINGS , Myopathy/Rhabdomyolysis ). Coumarin Anticoagulants: In a small clinical trial in which lovastatin was administered to warfarin treated patients, no effect on prothrombin time was detected. However, another HMG-CoA reductase inhibitor has been found to produce a less than two seconds increase in prothrombin time in healthy volunteers receiving low doses of warfarin. Also, bleeding and/or increased prothrombin time has been reported in a few patients taking coumarin anticoagulants concomitantly with lovastatin. It is recommended that in patients taking anticoagulants, prothrombin time be determined before starting lovastatin and frequently enough during early therapy to ensure that no significant alteration of prothrombin time occurs. Once a stable prothrombin time has been documented, prothrombin times can be monitored at the intervals usually recommended for patients on coumarin anticoagulants. If the dose of lovastatin is changed, the same procedure should be repeated. Lovastatin therapy has not been associated with bleeding or with changes in prothrombin time in patients not taking anticoagulants. Antipyrine: Lovastatin had no effect on the pharmacokinetics of antipyrine or its metabolites. However, since lovastatin is metabolized by the cytochrome P450 isoform 3A4, this does not preclude an interaction with other drugs metabolized by the same isoform (see WARNINGS , Myopathy/Rhabdomyolysis ). Propranolol: In normal volunteers, there was no clinically significant pharmacokinetic or pharmacodynamic interaction with concomitant administration of single doses of lovastatin and propranolol. Digoxin: In patients with hypercholesterolemia, concomitant administration of lovastatin and digoxin resulted in no effect on digoxin plasma concentrations. Oral Hypoglycemic Agents: In pharmacokinetic studies of lovastatin immediate-release in hypercholesterolemic non-insulin dependent diabetic patients, there was no drug interaction with glipizide or with chlorpropamide (see CLINICAL PHARMACOLOGY , Clinical Studies ). HMG-CoA reductase inhibitors interfere with cholesterol synthesis and as such might theoretically blunt adrenal and/or gonadal steroid production. Results of clinical trials with drugs in this class have been inconsistent with regard to drug effects on basal and reserve steroid levels. However, clinical studies have shown that lovastatin does not reduce basal plasma cortisol concentration or impair adrenal reserve, and does not reduce basal plasma testosterone concentration. Another HMG-CoA reductase inhibitor has been shown to reduce the plasma testosterone response to HCG. In the same study, the mean testosterone response to HCG was slightly but not significantly reduced after treatment with lovastatin 40 mg daily for 16 weeks in 21 men. The effects of HMG-CoA reductase inhibitors on male fertility have not been studied in adequate numbers of male patients. The effects, if any, on the pituitary-gonadal axis in premenopausal women are unknown. Patients treated with lovastatin who develop clinical evidence of endocrine dysfunction should be evaluated appropriately. Caution should also be exercised if an HMG-CoA reductase inhibitor or other agent used to lower cholesterol levels is administered to patients also receiving other drugs (e.g., ketoconazole, spironolactone, cimetidine) that may decrease the levels or activity of endogenous steroid hormones. Lovastatin produced optic nerve degeneration (Wallerian degeneration of retinogeniculate fibers) in clinically normal dogs in a dose-dependent fashion starting at 60 mg/kg/day, a dose that produced mean plasma drug levels about 30 times higher than the mean drug level in humans taking the highest recommended dose (as measured by total enzyme inhibitory activity). Vestibulocochlear Wallerian-like degeneration and retinal ganglion cell chromatolysis were also seen in dogs treated for 14 weeks at 180 mg/kg/day, a dose which resulted in a mean plasma drug level (C max ) similar to that seen with the 60 mg/kg/day dose. CNS vascular lesions, characterized by perivascular hemorrhage and edema, mononuclear cell infiltration of perivascular spaces, perivascular fibrin deposits and necrosis of small vessels, were seen in dogs treated with lovastatin at a dose of 180 mg/kg/day, a dose which produced plasma drug levels (C max ) which were about 30 times higher than the mean values in humans taking 80 mg/day. Similar optic nerve and CNS vascular lesions have been observed with other drugs of this class. Cataracts were seen in dogs treated for 11 and 28 weeks at 180 mg/kg/day and 1 year at 60 mg/kg/day. In a 21-month carcinogenic study in mice with lovastatin immediate-release, there was a statistically significant increase in the incidence of hepatocellular carcinomas and adenomas in both males and females at 500 mg/kg/day. This dose produced a total plasma drug exposure 3 to 4 times that of humans given the highest recommended dose of lovastatin (drug exposure was measured as total HMG-CoA reductase inhibitory activity in extracted plasma). Tumor increases were not seen at 20 and 100 mg/kg/day, doses that produced drug exposures of 0.3 to 2 times that of humans at the 80 mg/day lovastatin immediate-release dose. A statistically significant increase in pulmonary adenomas was seen in female mice at approximately 4 times the human drug exposure. [Although mice were given 300 times the human dose (HD) on a mg/kg body weight basis, plasma levels of total inhibitory activity were only 4 times higher in mice than in humans given 80 mg of lovastatin immediate-release]. There was an increase in incidence of papilloma in the non-glandular mucosa of the stomach of mice beginning at exposures of 1 to 2 times that of humans given lovastatin immediate-release. The glandular mucosa was not affected. The human stomach contains only glandular mucosa. In a 24-month carcinogenicity study in rats, there was a positive dose response relationship for hepatocellular carcinogenicity in males at drug exposures between 2-7 times that of human exposure at 80 mg/day lovastatin immediate-release (doses in rats were 5, 30 and 180 mg/kg/day). An increased incidence of thyroid neoplasms in rats appears to be a response that has been seen with other HMG-CoA reductase inhibitors. A chemically similar drug in this class was administered to mice for 72 weeks at 25, 100, and 400 mg/kg body weight, which resulted in mean serum drug levels approximately 3, 15, and 33 times higher than the mean human serum drug concentration (as total inhibitory activity) after a 40 mg oral dose of lovastatin immediate-release. Liver carcinomas were significantly increased in high-dose females and mid- and high-dose males, with a maximum incidence of 90 percent in males. The incidence of adenomas of the liver was significantly increased in mid- and high-dose females. Drug treatment also significantly increased the incidence of lung adenomas in mid- and high-dose males and females. Adenomas of the Harderian gland (a gland of the eye of rodents) were significantly higher in high dose mice than in controls. No evidence of mutagenicity was observed with lovastatin immediate-release in a microbial mutagen test using mutant strains of Salmonella typhimurium with or without rat or mouse liver metabolic activation. In addition, no evidence of damage to genetic material was noted in an in vitro alkaline elution assay using rat or mouse hepatocytes, a V-79 mammalian cell forward mutation study, an in vitro chromosome aberration study in CHO cells, or an in vivo chromosomal aberration assay in mouse bone marrow. Drug-related testicular atrophy, decreased spermatogenesis, spermatocytic degeneration and giant cell formation were seen in dogs starting at 20 mg/kg/day with lovastatin immediate-release. Similar findings were seen with another drug in this class. No drug-related effects on fertility were found in studies with lovastatin in rats. However, in studies with a similar drug in this class, there was decreased fertility in male rats treated for 34 weeks at 25 mg/kg body weight, although this effect was not observed in a subsequent fertility study when this same dose was administered for 11 weeks (the entire cycle of spermatogenesis, including epididymal maturation). In rats treated with this same reductase inhibitor at 180 mg/kg/day, seminiferous tubule degeneration (necrosis and loss of spermatogenic epithelium) was observed. No microscopic changes were observed in the testes from rats of either study. The clinical significance of these findings is unclear. Safety in pregnant women has not been established. Lovastatin immediate-release has been shown to produce skeletal malformations at plasma levels 40 times the human exposure (for mouse fetus) and 80 times the human exposure (for rat fetus) based on mg/m 2 surface area (doses were 800 mg/kg/day). No drug-induced changes were seen in either species at multiples of 8 times (rat) or 4 times (mouse) based on surface area. No evidence of malformations was noted in rabbits at exposures up to 3 times the human exposure (dose of 15 mg/kg/day, highest tolerated dose of lovastatin immediate-release). Rare reports of congenital anomalies have been received following intrauterine exposure to HMG-CoA reductase inhibitors. In a review 2 of approximately 100 prospectively followed pregnancies in women exposed to lovastatin immediate-release or another structurally related HMG-CoA reductase inhibitor, the incidences of congenital anomalies, spontaneous abortions and fetal deaths/stillbirths did not exceed what would be expected in the general population. The number of cases is adequate only to exclude a 3 to 4-fold increase in congenital anomalies over the background incidence. In 89% of the prospectively followed pregnancies, drug treatment was initiated prior to pregnancy and was discontinued at some point in the first trimester when pregnancy was identified. As safety in pregnant women has not been established and there is no apparent benefit to therapy with ALTOPREV during pregnancy (see CONTRAINDICATIONS ), treatment should be immediately discontinued as soon as pregnancy is recognized. ALTOPREV should be administered to women of child-bearing potential only when such patients are highly unlikely to conceive and have been informed of the potential hazard. It is not known whether lovastatin is excreted in human milk. Because a small amount of another drug in this class is excreted in human breast milk and because of the potential for serious adverse reactions in nursing infants, women taking ALTOPREV should not nurse their infants (see CONTRAINDICATIONS ). Safety and effectiveness in pediatric patients have not been established. Because pediatric patients are not likely to benefit from cholesterol lowering for at least a decade and because experience with this drug is limited (no studies in subjects below the age of 20 years), treatment of pediatric patients with ALTOPREV is not recommended at this time. Of the 467 patients who received ALTOPREV in controlled clinical studies, 18% were 65 years and older. Of the 297 patients who received ALTOPREV in uncontrolled clinical studies, 22% were 65 years and older. No overall differences in effectiveness or safety were observed between these patients and other reported clinical experience has not identified differences in response between the elderly and younger patients, but greater sensitivity of some older individuals cannot be ruled out. Thus, lower starting doses of ALTOPREV are recommended for elderly patients, particularly those with complicated medical conditions. (see DOSAGE AND ADMINISTRATION , Elderly Patients ). In pharmacokinetic studies with lovastatin immediate-release, the mean plasma level of HMG-CoA reductase inhibitory activity was shown to be approximately 45% higher in elderly patients between 70-78 years of age compared with patients between 18-30 years of age; however, clinical study experience in the elderly indicates that dosage adjustment based on this age-related pharmacokinetic difference is not needed. In the two large clinical studies conducted with lovastatin immediate-release (EXCEL and AFCAPS/TexCAPS), 21% (3094/14850) of patients were >/=65 years of age. 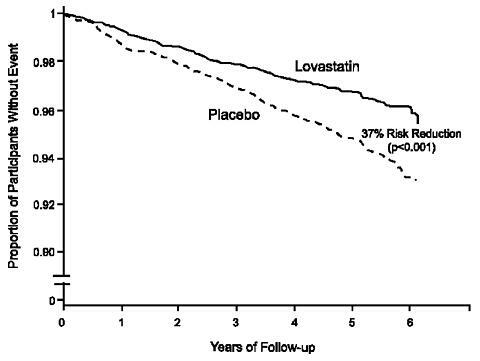 Lipid-lowering efficacy with lovastatin was at least as great in elderly patients compared with younger patients, and there were no overall differences in safety over the 20 to 80 mg dosage range (see CLINICAL PHARMACOLOGY ). In clinical studies with ALTOPREV, adverse reactions have generally been mild and transient. In controlled studies with 467 patients who received ALTOPREV, <3% of patients were discontinued due to adverse experiences attributable to ALTOPREV. This was similar to the discontinuation rate in the placebo and lovastatin immediate-release treatment groups. Pooled results from clinical studies with ALTOPREV show that the most frequently reported adverse reactions in the ALTOPREV group were infection, headache and accidental injury. Similar incidences of these adverse reactions were seen in the lovastatin and placebo groups. The most frequent adverse events thought to be related to ALTOPREV were nausea, abdominal pain, insomnia, dyspepsia, headache, asthenia, and myalgia. In controlled trials (e.g., vs. placebo and vs. lovastatin immediate-release), clinical adverse experiences reported as >/=5% in any treatment group are shown in Table VII below. In Phase III controlled clinical studies involving 613 patients treated with lovastatin immediate-release, the adverse experience profile was similar to that shown below for the 8,245-patient EXCEL study [see Expanded Clinical Evaluation of Lovastatin (EXCEL) Study ]. Persistent increases of serum transaminases have been noted (see WARNINGS , Liver Dysfunction ). About 11% of patients had elevations of CK levels of at least twice the normal value on one or more occasions. The corresponding values for the control agent cholestyramine was 9%. This was attributable to the noncardiac fraction of CK. Large increases in CK have sometimes been reported (see WARNINGS , Myopathy/Rhabdomyolysis). Lovastatin immediate-release was compared to placebo in 8,245 patients with hypercholesterolemia [Total-C 240-300 mg/dL (6.2-7.8 mmol/L)] in the randomized, double-blind, parallel, 48-week EXCEL study. Clinical adverse experiences reported as possibly, probably or definitely drug-related in >/=1% in any treatment group are shown in the table below. For no event was the incidence on drug and placebo statistically different. Other clinical adverse experiences reported as possibly, probably or definitely drug-related in 0.5% to 1.0% of patients in any drug-treated group are listed below. In all these cases the incidence on drug and placebo was not statistically different. Body as a Whole: chest pain; Gastrointestinal: acid regurgitation, dry mouth, vomiting; Musculoskeletal: leg pain, shoulder pain, arthralgia; Nervous System/Psychiatric: insomnia, paresthesia; Skin: alopecia, pruritus; Special Senses: eye irritation. In the EXCEL study (see CLINICAL PHARMACOLOGY , Clinical Studies ), 4.6% of the patients treated up to 48 weeks were discontinued due to clinical or laboratory adverse experiences which were rated by the investigator as possibly, probably or definitely related to therapy with lovastatin immediate-release. The value for the placebo group was 2.5%. In AFCAPS/TexCAPS (see CLINICAL PHARMACOLOGY , Clinical Studies ) involving 6,605 participants treated with 20-40 mg/day of lovastatin immediate-release (n=3,304) or placebo (n=3,301), the safety and tolerability profile of the group treated with lovastatin immediate-release was comparable to that of the group treated with placebo during a median of 5.1 years of follow-up. The adverse experiences reported in AFCAPS/TexCAPS were similar to those reported in EXCEL [see ADVERSE REACTIONS , Expanded Clinical Evaluation of Lovastatin (EXCEL) Study ]. In controlled clinical studies in which lovastatin immediate-release was administered concomitantly with cholestyramine, no adverse reactions peculiar to this concomitant treatment were observed. The adverse reactions that occurred were limited to those reported previously with lovastatin or cholestyramine. Other lipid-lowering agents were not administered concomitantly with lovastatin during controlled clinical studies. Preliminary data suggests that the addition of gemfibrozil to therapy with lovastatin is not associated with greater reduction in LDL-C than that achieved with lovastatin alone. In uncontrolled clinical studies, most of the patients who have developed myopathy were receiving concomitant therapy with cyclosporine, gemfibrozil or niacin (nicotinic acid) (see WARNINGS , Myopathy/Rhabdomyolysis ). The following effects have been reported with drugs in this class. Not all the effects listed below have necessarily been associated with lovastatin therapy. Gastrointestinal: pancreatitis, hepatitis, including chronic active hepatitis, cholestatic jaundice, fatty change in liver; and rarely, cirrhosis, fulminant hepatic necrosis, and hepatoma; anorexia, vomiting. Laboratory Abnormalities: elevated transaminases, alkaline phosphatase, (gamma)-glutamyl transpeptidase, and bilirubin; thyroid function abnormalities. After oral administration of lovastatin immediate-release to mice the median lethal dose observed was >15 g/m 2 . Five healthy human volunteers have received up to 200 mg of lovastatin as a single dose without clinically significant adverse experiences. A few cases of accidental overdosage with lovastatin immediate-release have been reported; no patients had any specific symptoms, and all patients recovered without sequelae. The maximum dose taken was 5 g-6 g.
Until further experience is obtained, no specific treatment of overdosage with ALTOPREV can be recommended. The dialyzability of lovastatin and its metabolites in man is not known at present. The patient should be placed on a standard cholesterol-lowering diet before receiving ALTOPREV and should continue on this diet during treatment with ALTOPREV (see NCEP Treatment Guidelines for details on dietary therapy). The usual recommended starting dose is 20, 40, or 60 mg once a day given in the evening at bedtime. The recommended dosing range is 10-60 mg/day, in single doses. Doses should be individualized according to the recommended goal of therapy (see NCEP Guidelines and CLINICAL PHARMACOLOGY ). A starting dose of 10 mg may be considered for patients requiring smaller reductions. Adjustments should be made at intervals of 4 weeks or more. See below for dosage recommendations in special populations (i.e., elderly patients, or patients with complicated medical conditions or renal insufficiency) or for patients receiving concomitant therapy (i.e. cyclosporine, amiodarone, verapamil, fibrates or niacin). Cholesterol levels should be monitored periodically and consideration should be given to reducing the dosage of ALTOPREV if cholesterol levels fall significantly below targeted range. The usual recommended starting dose in elderly patients (age >/=65 years) or patients with complicated medical conditions (renal insufficiency, diabetes) is 20 mg once a day given in the evening at bedtime. Higher doses should be used only after careful consideration of the potential risks and benefits (See NCEP Guidelines and WARNINGS , Myopathy/Rhabdomyolysis ). A starting dose of 10 mg may be considered for patients requiring smaller reductions. In patients taking cyclosporine concomitantly with ALTOPREV (see WARNINGS , Myopathy/Rhabdomyolysis), therapy should begin with 10 mg of ALTOPREV and should not exceed 20 mg/day. In patients taking amiodarone or verapamil concomitantly with ALTOPREV, the dose should not exceed 20 mg/day (see WARNINGS , Myopathy/Rhabdomyolysis and PRECAUTIONS , Drug Interactions , Other Drug Interactions ). Use of ALTOPREV with fibrates or niacin should generally be avoided. However, if ALTOPREV is used in combination with gemfibrozil, other fibrates, or lipid-lowering doses (>/= 1 g/day) of niacin, the dose of ALTOPREV should not exceed 20 mg (see WARNINGS , Myopathy/Rhabdomyolysis and PRECAUTIONS , Drug Interactions ). In patients with severe renal insufficiency (creatinine clearance <30 mL/min), dosage increases above 20 mg/day should be carefully considered and, if deemed necessary, implemented cautiously (see CLINICAL PHARMACOLOGY and WARNINGS , Myopathy/Rhabdomyolysis ). ALTOPREV lovastatin extended-release tablets are supplied as round, convex shaped tablets containing 10 mg, 20 mg, 40 mg and 60 mg of lovastatin. NDC 59630-627-30: 10 mg extended-release dark orange-colored tablets imprinted with Andrx logo and 10 on one side, bottles of 30. NDC 59630-628-30: 20 mg extended-release orange-colored tablets imprinted with Andrx logo and 20 on one side, bottles of 30. NDC 59630-629-30: 40 mg extended-release peach-colored tablets imprinted with Andrx logo and 40 on one side, bottles of 30. NDC 59630-630-30: 60 mg extended-release light peach-colored tablets imprinted with Andrx logo and 60 on one side, bottles of 30. Store at controlled room temperature 20°-25° C (68°-77°F). Avoid excessive heat and humidity. Kantola, T, et al. Clin Pharmacol Ther 1998; 63(4):397-402. Manson, J.M., Freyssinges, C., Ducrocq, M.B., Stephenson, W.P., Postmarketing Surveillance of Lovastatin and Simvastatin Exposure During Pregnancy. Reproductive Toxicology. 19(6):439-446. 1996.